WASHINGTON, Nov. 7 (Xinhua) -- On Wednesday, Nov. 8, the planet Mercury will pass directly in front the sun. The transit begins at 2:12 p.m. EST (19:12 GMT) and lasts for almost five hours, according to NASA's forecast. Good views can be had from the Americas, Hawaii, Australia and all along the Pacific Rim. 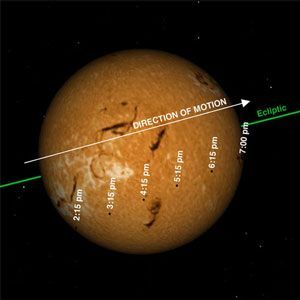 During the transit, Mercury's tiny disk-- jet black and perfectly round -- will glide slowly across the face of the sun. Only a speck of the sun's surface is actually covered, so the sun remains as dangerous as ever to look at. But with a proper filter and a little imagination, the transit of Mercury can be a marvelous experience.